The gathered releases considered here are as disparate and divergent as any I might bundle for review. These gatherings are selected by no other design or consideration than their place in my review queue This batch, however, possesses a quality of intense focus and minimal means that brought to mind the descriptor stripped down. Listen to them in rotation, as I have done these past weeks, and it becomes very clear that the scope of stripped down is actually as vast as the ocean. Several are organized around, as has happened increasingly in my sphere of listening projects, location/field recordings. Many of the releases I wrote about most enthusiastically last year integrated similar recordings within composed and improvised works for conventional instrumentation; they were, however, characterized largely by a fecundity and abundance of sounds, their weft and weight the result of many sonic layers and striations, both organic and otherwise [Pisaro’s July Mountain, Rossetto’s Mineral Orange]. The offerings here, excepting a couple pieces on the Chabala/French duo release, Trammels, can be placed on the continuum between stripped down and bare bones. As I said, vast is the acousmatic ocean. As I was considering stripped down, how close so many musicians I dig are getting to the very marrow where sound and silence manifest most dynamically, I stumbled upon Sciarrino’s pith phrase about such things – acousmatic silence is, he said, a silence which itself is an infinite rumbling of microscopic sonorities. That definition certainly comes to mind listening to much of the recent output of fellows like Jez Riley French, Barry Chabala, Daniel Jones, et al. On Trammels, French and Chabala offer four pieces, three photographic scores by French, and a long-distance sound file collaboration. The first two scores are interpreted by Chabala alone; these are works of medium duration and considerable dynamic range. Chabala’s assurance and deft handling of appositely placed sounds and silences continues to impress. He works with seamless segues between silent and near-silent sustained tensions, and surges of floating guitar tones that are simply gorgeous. These are photographic scores that blend, blur, and cross-fade naive guitar melodies, the shimmer and aura of chromatic droneage, the throbs and oscillations captured on recordings of traffic, both aerial and earth-bound, and, on the third piece, where French takes a solo turn, a mesh of elemental colors issuing from French’s arsenal of salt, glass, paper and coiled wire. This last, entitled (…) a coda, ranks easily alongside the aforementioned Daniel Jones’ exacting When On and Off Collide [Cathnor 007], as the quietest music I’ve listened to in a long while. [While I am referencing Jones’ work, I’ll mention it overlaps with Chabala’s approach to sustained silences and surges, and you’d do well to check it out]. 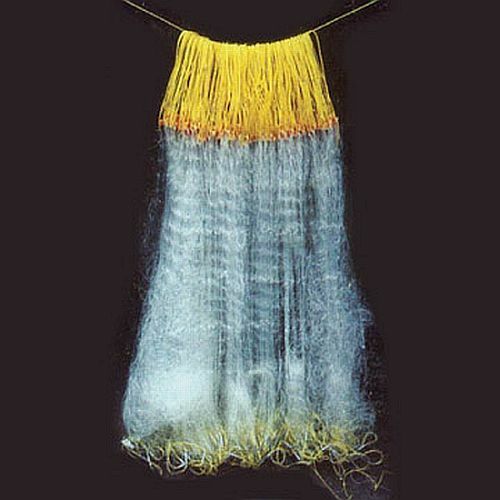 Weft and mesh are apposite words for this excellent release, as a trammel [one example pictured above] is a net woven of both very fine and very coarse materials. Graham Lambkin continues his mission of presenting Belgian composer Moniek Darge’s prescient, effulgent work from the past three decades to a new audience, one largely saturated with, among other offerings, today’s surfeit of available processed field recordings. To my ears, Lambkin, as I wrote last year, finds in polymath Darge’s work a deep resonance with his own, and we are the richer for his restoration act. Sounds From Sacred Places [Kye Records], first issued in 1987, is comprised of five pieces, all involving Darge’s strange, lovely sonic embroidery around site-specific machinery and mechanisms, like those used to toll abbey bells, or the archetypically familiar thrum and drone of power plants [the one pictured above is found in the Turkish Square in Darge’s native Gent, yielding my favorite sounds of this release]. There is a remarkable acuity to Darge’s listening, manifested in her subtle use of processing, looping and, on Turkish Square, enlacing the natural overtones and resonances at the source of the recording with oscillating tones in such a way that the boundary between Darge and the sacred place is erased. Easier said than accomplished, as evidenced by so many current works using location recordings. The last two pieces are overtone-rich bell-tolled waves of pure energy, far ahead of similar works to come in the ensuing nearly three decades. Every Darge release Lambkin has reintroduced on his Kye imprint [this is the third] merits your attention, if you are at all keen on music made by composers who know where to place their attention in any noisy environment, alert to the possibilities, and sift and strain from the blooming, buzzing confusion, particles of the sacred. Speaking of archetypes, Taku Unami. Initially some cast him as an enfant terrible [no], and lately he’s been discussed as either the anodyne for an enervated area of music, or the naked emperor. In my review of Unami’s delightfully vexing duo with Annette Krebs, motubachii, I quoted Erstwhile Records’ Jon Abbey description of their work as a puzzle box of sound. 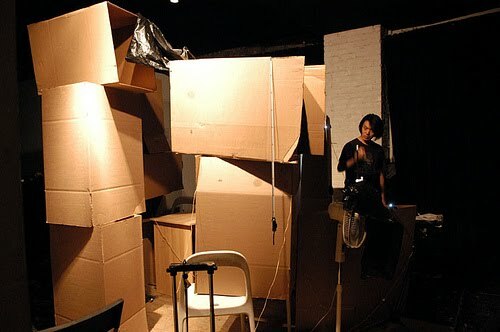 Earlier this year, in his raucous stand [face it, relative to most EAI performances, Unami is raucous] at the Amplify 2011 festival, Unami dashed the puzzle, and made his sounds from boxes. To my ears [handicapped by not yet experiencing Unami in performance], he is the archetypal trickster, manifested in Japanese popular consciousness [and occasionally popping up in Miyazaki’s fantastic films] as the kitsune. They are any scenes’ heterodox, garnering both, as witnessed on music fora, opprobrium and hero-status. These are equally silly takes; Unami, I am confident, loves mischief – but mischief made skillfully and, at times, elegantly. His two duos on the elegant winds measure imprint will do nothing to mollify the detractors, and may well solidify his kitsune status. I am, despite many listens to both, especially reluctant to say much about these releases. am wind, d±50 pairs Unami with Wandelweiser composer Stefan Thut; one side is comprised of wind recordings and measured silences, the other of Thut’s cello, Unami’s subtle sine tones, and a hella amount of environmental noises leeching and limning the duo’s sound. I will break my reluctance [some stuff for me just necessitates as little verbiage as possible, if you think, as I do, that our responses as listeners are accretions that become attached to the music itself] to say this is a lovely release that sits, on our continuum of the pure and stripped, at the most austere point [alongside French’s (…) a coda] of the works gathered here. Unami’s duo with Angharad Davies, two hands, seems to have pushed a few of my fellows into the naked emperor contingent. Both sides consist of much sporadic clapping; on one side, Unami claps, Davies, a remarkable violinist, scrapes, rubs and plinks in parallel play; on the other side, both clap. If this doesn’t piss you off, or strain credulity adequately, most of the hand claps are at ppp or pppp. Unami’s embrace of the stripped down – on antecedent works, such as motubachii, he claps amidst many other generated sounds – comes across as vulnerable, and anti-virtuosic. The degree to which you regard this sort of offering as precious or calculatedly naive will determine how you feel about my favorite kitsune’s current work. I am confident that you will agree winds measure is producing the most beautifully designed packaging available. I was pretty effusive about Ernst Karel’s last location recording, Heard Laboratories, taking the opportunity to reprise Truman Capote’s pith observation I believe more in the scissors than I do in the pencil. This is Karel’s great knack, his intuitive selection of sounds, sound-shaping, and – I hasten to add as one who feels the onus of every new release that insists on 70-80 minutes of sound because the media allows it – concision, privileging the scissors as much as the pencil [the total time is 78 minutes, but spanning nine tracks offering an amazing variety of sounds and rhythms]. Works like Swiss Mountain Transport Systems, its prosaic title redirecting your attention back to the music, where it belongs, evince in me a feeling I value a great deal – as much as the important question is do I like the sounds, the work reminds me I have a kindred spirit in these realms, the realms of music I hear daily in nearly every environment I pass through. 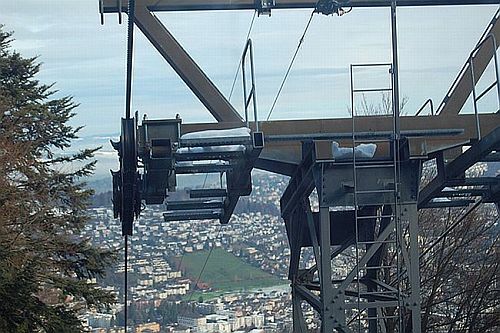 Karel hears machinery singing, in this instance the gondolas and chair lifts that transport humans into a vastness of space that makes attunement to their music an antidote to the feeling of total engulfment that must visit anyone riding and rising to such altitudes. 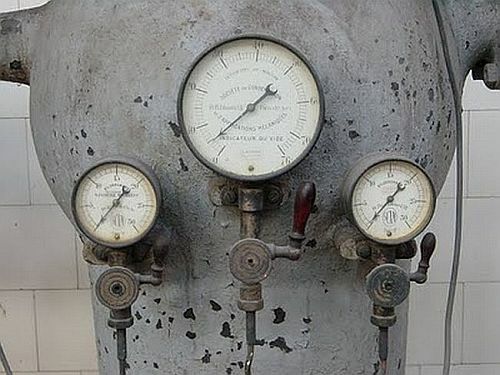 Machines like the one above do sing, and we only occasionally hear a human voice penetrate their secret concentus. Upper partial winds, droning continuous cable systems, and singing tramways – Karel reveals, as he did with the research labs at Harvard, as Darge has for many years, that it is people, places and things that make music, whether we pass by or not. Karel passes into these sound worlds, pointing his microphones, and our attention, just where they are needed. Of course, this is the documentarian’s gift to us, a glimpse of otherwise inaccessible worlds, pure and stripped of everything but what we need to hear the music. …the blooming, buzzing confusion… is from William James’ studies in categorical perception. The kitsune, the Japanese archetype for the trickster, is depicted as a fox. While the Amerindian trickster, the coyote, works as well, when I think Unami, I think fox. This entry was posted in music writing on December 18, 2011 by jessewgoin.